Ms. Dowd committed several errors in her assertions about the economy. First, if an upper income person receives a tax cut he has three choices: spend all or some of the money, save and invest some or all of the money, or add some or all the money to his cash balances – checking account, money market account, or treasury bills. In other words, Ms. Dowd is totally clueless about what “rich” people could do with extra income from tax cuts. Rich folks do not take their tax cuts and bury them in the backyards or put them in the cookie jar of their McMansions. They “pour money” back into the economy according to their preferences. In fact, rich folks provided the overwhelming amount of venture capital that made Silicon Valley and other startups so successful. Second, competent economists have long discredited the so-called multiplier effect of people spending their tax cuts money. Ms. Dowd should read Frank Shostak’s critique of the so-called Keynesian multiplier effect on the economy. She would learn that savings and investment drive the economy, not consumer demand. In other words, before people can consume production has to take place. 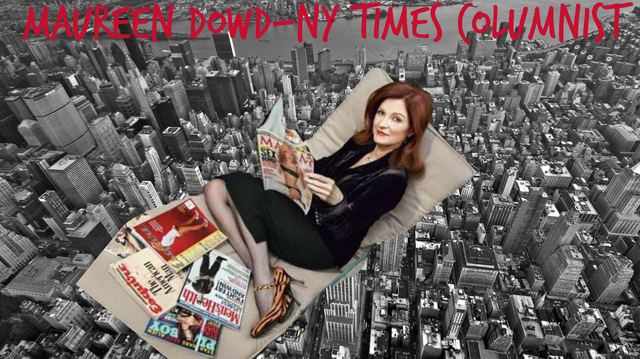 Ms. Dowd should stick to her knitting – ranting about Trump and Russian meddling– and learn about how an economy works by immersing herself in the writings of Mises, Hayek, Hazlitt, Rothbard and dozens of other insightful economists of the Austrian school. Dr. Murray Sabrin is Professor of Finance in the Anisfield School of Business at Ramapo College of New Jersey The above originally appeared at his website, MurraySabrin.com. And if the rich folks did bury their cash in their backyards, this would marginally improve things for the poor folks by reducing the amount of money and thus increasing the purchasing power of everyone else's cash balances. Still, many people are non-rational or only nearly rational in certain situations. And the definition of "self-interest" as the pursuit of the fulfillment of preferences is a tautology.